I'm researching my 2nd great-grandfather who was in the 87th Indiana Infantry Regiment in Co B. His name was Cornelius W. Doremus. Both he and his brother Christopher J. Doremus enlisted the same day -- August 2, 1862. Unfortunately Cornelius got sick and passed not quite four months later, November 23, 1862 in Louisville, Kentucky. What I'm trying to find is any photo of this regiment. I have 3 photos of Christopher but none of Cornelius and I wonder if any exist. I have Cornelius's pension record but I'm going to order his compiled service record and any medical records. Though they fought at Perryville Oct 8th, I'm not so certain Cornelius was with them or fought any battles. What I'm trying to find is any information on this regiment from time he enlisted to time he died and especially if a photo exists of the 87th, let alone Co B. I really want to find out what life was like for him and anything I can about him. I do know of the monument that sits on the courthouse lawn in Winamac. It has all the men listed by name who died from Pulaski County. Thank you for your time and any suggestions you may have. I am looking for any info on John Harmon Wilkinson or pictures of my grandfather. Birth 07/21/1884, Howard County, IN; died 05/04/1961, Lafayette, IN. Looking for birth certificate, things like that. 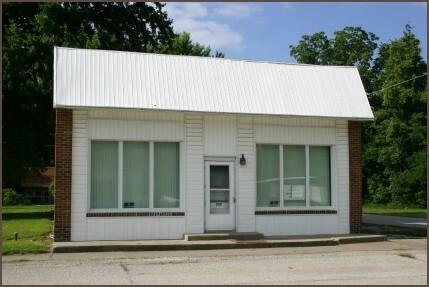 The Indiana Genealogical Society recently delivered Digitization Kit #25 to the Clay County Genealogical Society in the historic coal town of Center Point, Indiana. The CCGS is housed in this former store building at 309 Main Street. The Society has a great genealogy and history collection maintained by a strong volunteer contingent. If you have Clay County ancestors, you need to contact or, even better, visit Center Point. The library is open Monday, Wednesday, and Saturday, 10 to 4. Meanwhile, take a look at their website at www.ccgsilib.org, as shown below. Does your organization have Indiana genealogy materials that need digitizing, but you're short on equipment? Consider applying for a digitization kit as part of IGS's Indiana Genealogy Digitization Project. Wikipedia can be a good source for finding ghost towns. Go to the Wikipedia page for the county you're interested in and scroll to the list of communities. 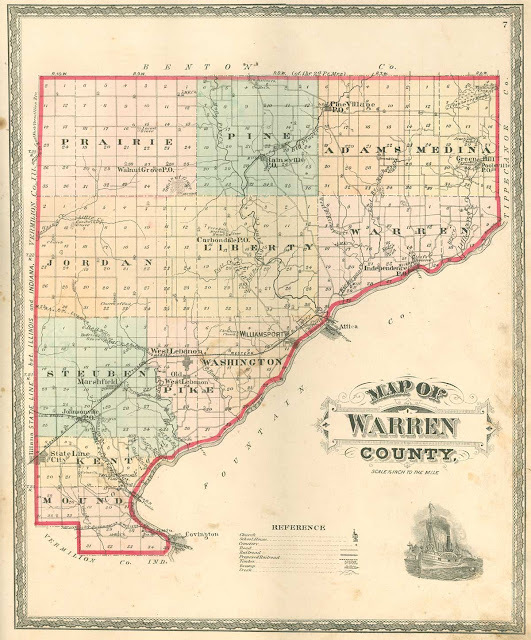 The page for Warren County, Indiana, for example, lists the following "extinct places:"
Being able to locate these places will help you better understand the documents where you find them mentioned. New FREE Databases for Howard, Owen and Vigo Counties and More! From a 1930 alumni souvenir. A handwritten list in the back of a 1930 alumni souvenir. 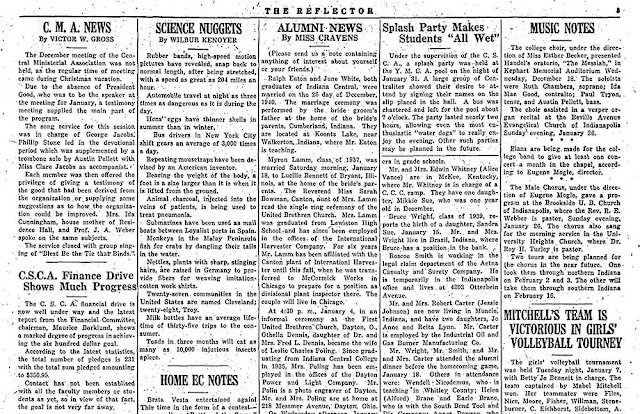 Miscellaneous materials about the Kokomo YMCA, including a 1930s basketball team roster and photo and a 1937 newspaper article. A typewritten list of burials that was found in an old notebook. A typewritten list of lots in Lake Hollybrook that had been sold as of July 14, 1930. A program for a July 18, 1941 show to benefit the West Terre Haute Police Department. It includes the names of performers and ads for local businesses. Information about 11 Confederate prisoners of war who died in a local prison and were buried in Woodlawn Cemetery. A 1956 history of the Indiana University Training School for Nurses. A booklet containing news of various employees and the company's 1964 annual report. A booklet published by the Allison Engine Division of General Motors Corporation, Indianapolis. Does your organization have Indiana genealogy materials that need digitized? Consider applying for equipment through the Indiana Genealogy Digitization Project. Merrimon Straughn was my 4th-great grandfather. He was married to Hannah Vickery, daughter of Jehu Vickery and Lydia Levenwood Leonard, who I believe were Quakers. Our family records indicate the station in Dudley Township, Henry County, was named after Merrimon, now known as Straughn, IN. Supposedly, they were inn keepers of Straughn's Station. For more info on this family, where would you suggest I look? I have located digital images of both of their gravestones. I'm trying to find out how John Myers, living in Perry Township, Marion County, Indiana died in July of 1860. I've found his burial and he is listed on that census, but two days later is dead. Also his youngest two sons don't show up on records after that census - William and Peter, both under the age of 10. If anyone can help me answer the questions about what happened to these family members, I'd be very thankful. 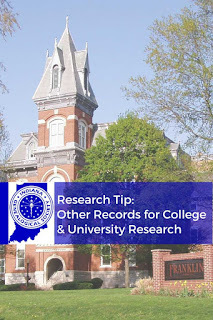 Yearbooks and catalogs are probably the first two things that come to mind when thinking about resources for ancestors who went to college or who were faculty. However, there are several other types of records that you should consider. 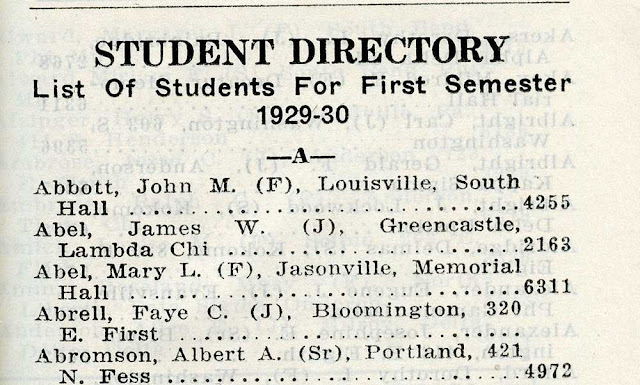 Student directories, sometimes known as handbooks or manuals, contained information on the students as well as the faculty and various campus organizations, including fraternities and sororities. 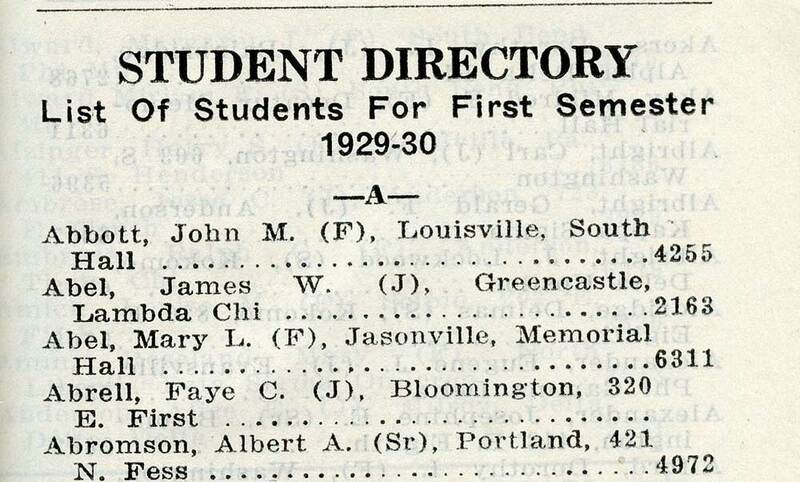 This example from Indiana University's student directory, which they called "the red book," for the 1929-1930 school year, included the student's name, year, hometown, and the name of their residence hall or fraternity/sorority, as well as a phone number. Student-produced newspapers can offer a glimpse into the daily life on campus. They contain information not just on the school's sports teams, but various clubs and associations, sprinkled in with news from alumni. This example from Indiana Central College (now University of Indianapolis)'s student newspaper for January 1941 includes news of several alumni who have gotten married, as well as a trip to an indoor pool — a treat during an Indiana winter. 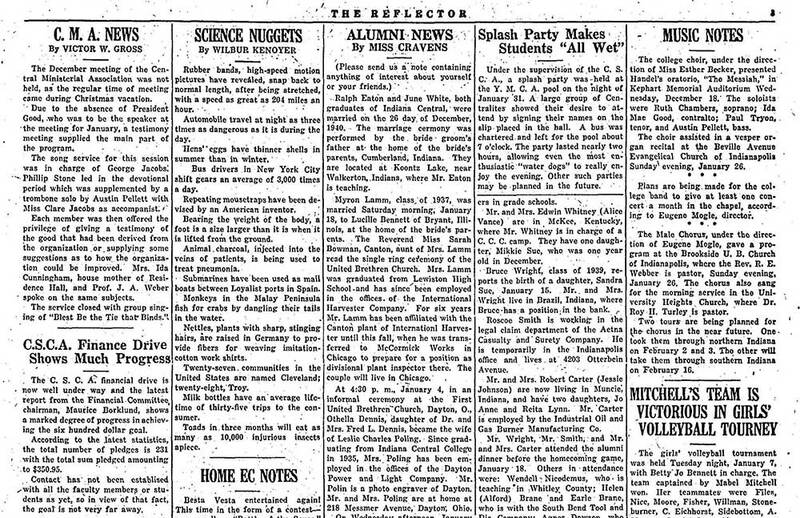 (Indiana Central College) Reflector, January 1941. Commencement programs can contain detailed information about those who are graduating, as well as the schedule of events and commencement speakers. Ball State University's June 1969 commencement program contains a list of the graduates for the Master of Science degree, including their name, hometown, where they earned their undergraduate degree, and the subject of their degree. We can also see that they're not actually graduating until August. Ball State University commencement program, June 1969. Alumni directories are valuable because students were likely to keep in touch long after their graduation. The directories of alumni that the schools would periodically publish are valuable not just for finding out a woman's married name, but for the level of detail they could include. 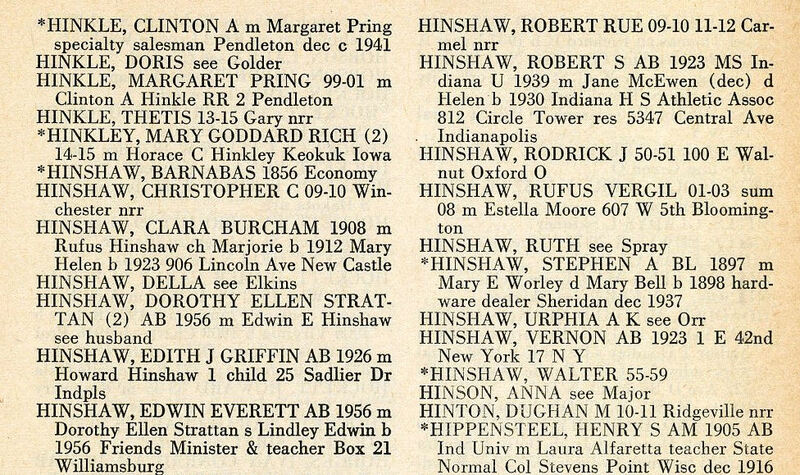 Earlham College's 1957 alumni directory, for example, show the alumnus's name, degree they earned, year of graduation, spouse's name, children's name, children's years of birth, occupation, and current residence. Earlham College Alumni Directory, 1957. 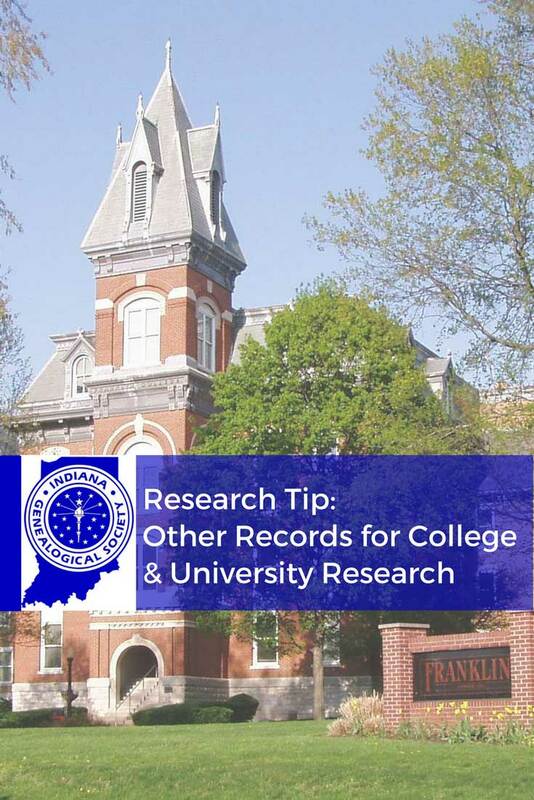 You can also find Indiana college and university records in the "College Records" section of the IGS website. If you want to find out more about using college catalogs, be sure to check out this blog post. Yesterday IGS delivered Kit 24 to the Martin County Historical Society, which is located in this great Museum in Shoals, Indiana. A former courthouse, the building is crammed with great artifacts and exhibits and especially with tons of documents waiting digitization. Get ready for some great resources coming out of Martin County. This Museum is well worth a visit to see some early Americana, Indiana-style. 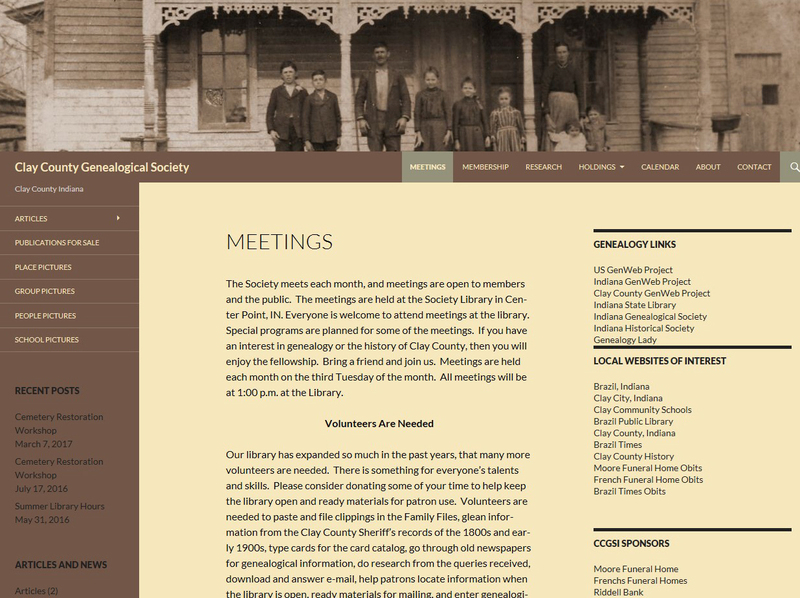 Does your organization have Indiana genealogy materials that need digitizing? Consider applying for a portable scanning kit from IGS. You can find details and the application form on the Indiana Genealogy Digitization Project page. 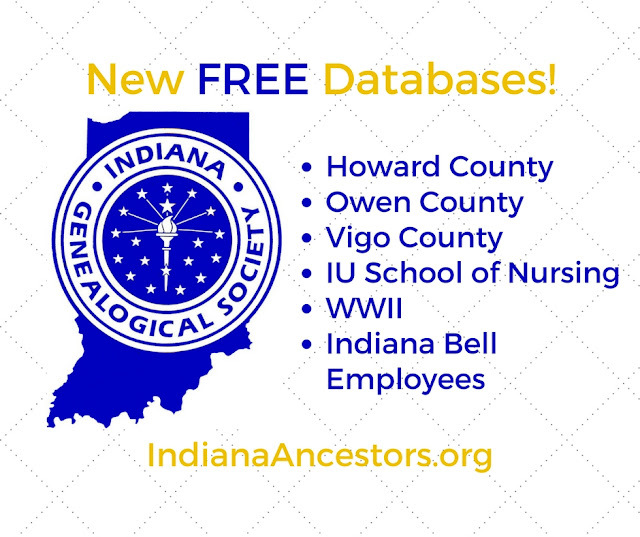 Take a look at these new databases from around the great state of Indiana. A list of alumni, as published in the school's 1938 yearbook, The Libertonian. This database was contributed by Wayne Klusman. These databases are available to IGS members. Not a member yet? Join today and get access to these and more than 1,900 other databases on the IGS website! A list from the June 6, 1913 commencement program. A list of students (grade 12 only) from the school's 1896 yearbook, Souvenir. A list from the May 10, 1924 commencement program. NOTE: A common school went up to 8th grade. Browsable digital images of teachers in grades 9 through 12, as published in the school's 1933 yearbook, The Tifoon 1933. A list of students (grade 12 only), as published in the school's 1914 yearbook, The Squealer. A list of teachers, as published in the school's 1914 yearbook, The Squealer. A list of students in grades 9-12, as published in the school's 1919 yearbook, The Valenian. A list from the May 6, 1927 commencement program. A list from the May 27, 1936 commencement program. 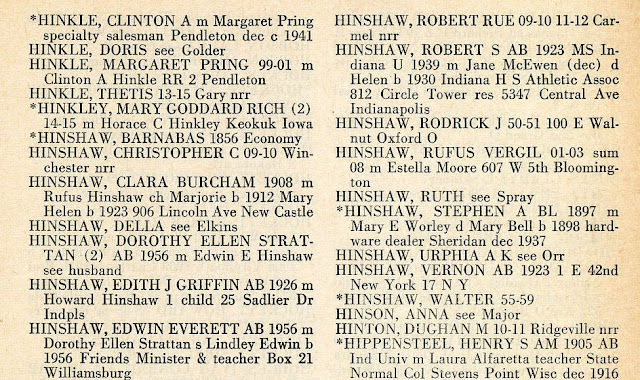 A list of alumni, as published in the school's 1933 yearbook, 1933 Epitome. A list from the June 4, 1920 commencement program. This database includes the graduate's name and the degree they received. A list compiled from the school's annual catalogs for the 1905-1906 school year through the 1907-1908 school year. This database includes the student's name, hometown and subject, as well as the catalog year. NOTE: Indiana Central University later changed its name to the University of Indianapolis. A list from the June 3, 1928 commencement program. This database includes the graduate's name, residence and the degree they received. A list compiled from the school's annual reports for the years 1848 through 1917 (some annual reports are missing - 1854, 1890, 1910, 1912 and 1916). This database includes the student's name, hometown, county and year of the annual report.